Nando's PER-i-PERi opened in my neck of the woods (Woodley Park, less than a mile away) a few months ago; and although I've had several meals there already, this was my first official (i.e. review) visit. 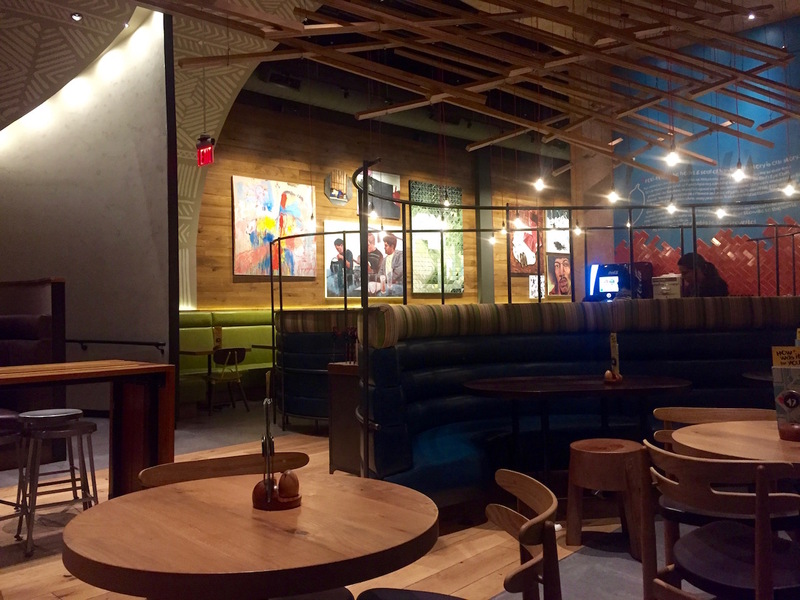 If you've read my prior reviews of Nando's Dupont Circle, H Street and Tenleytown locations, then odds are, you know where this one is headed. Straight to the top, as (yawn) usual. Make no mistake. Great food is by no means boring; but what makes Nando's so special, is their consistency (as in great, every time.) Last week's visit was no different. I stopped by on a Thursday night, just after 7:30. This particular Nando's is in close proximity to several big hotels, so you never know when it's going to be packed inside. That's a great problem to have, if its your business; but if you're like me (anti-crowds) it can be slightly daunting. Lucky for me, I had my choice of seats, and grabbed a table in the front corner. Like its siblings, the Woodley Nando's is beautiful to look at (only one level, but gorgeous.) Warm greetings are standard (there's a host station, before you order) and it's impeccably clean throughout. Music is unique and wonderful (Bio Ritmo, Jovino Dos Santos, Nickodemus) and played at a perfect decibel. Am I the only one who's waiting for a Nando's soundtrack CD? The ordering process is a breeze. My cashier couldn't have been nicer, and was quick to applaud my choice of dessert (Four-High Carrot Cake, see below.) He was also nice enough not to judge... I ordered three sides, including two starches (Portuguese Rice, Red Skin Mashed Potatoes.) Both are out-of-this-world delicious, and worthy of ordering extra (to take home, for later.) I opted for a Half-Chicken, and went with a milder (MEDIUM) marinade than normal. 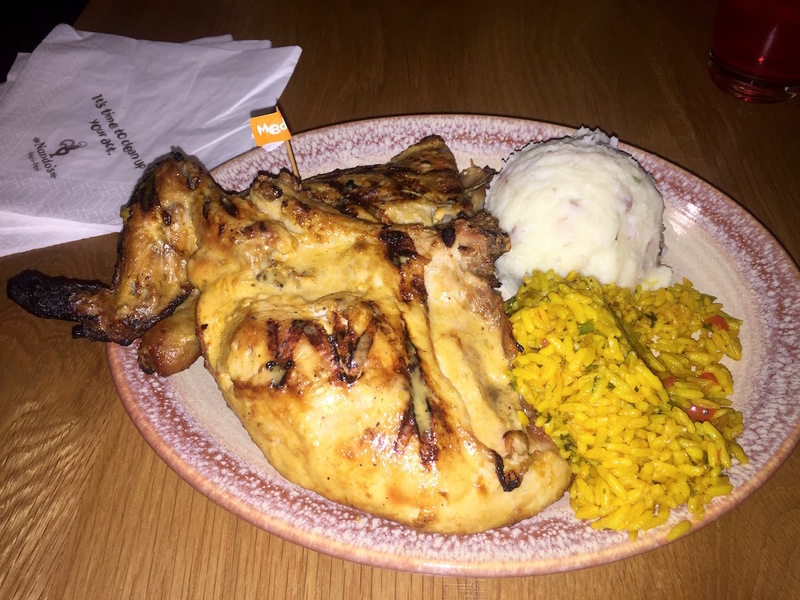 Take it from someone who likes their food spicy: Nando's Xtra Hot & Hot are just that... hot. Medium is pretty much close-to-perfect, and an obvious choice for beginners. Before chicken however, there was the matter of an appetizer. Nando's Wings are killer, as are their insanely good PERi-PERi Nuts; but it's been a while since I had their Hummus with PERi-PERi Drizzle, so drizzle I did (and then some.) It's advertised as tangy, and it certainly lives up to its billing. To be frank, I found it spicy (even without the drizzle, which comes in a cute little bottle) and fabulous. 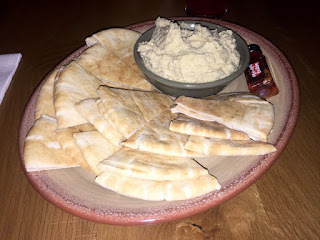 Better in fact, than the much-lauded hummus at nearby Lebanese Taverna. The pita bread was warm with visible grill marks on the bottom. Within minutes, my plate was empty. What more could you ask for? 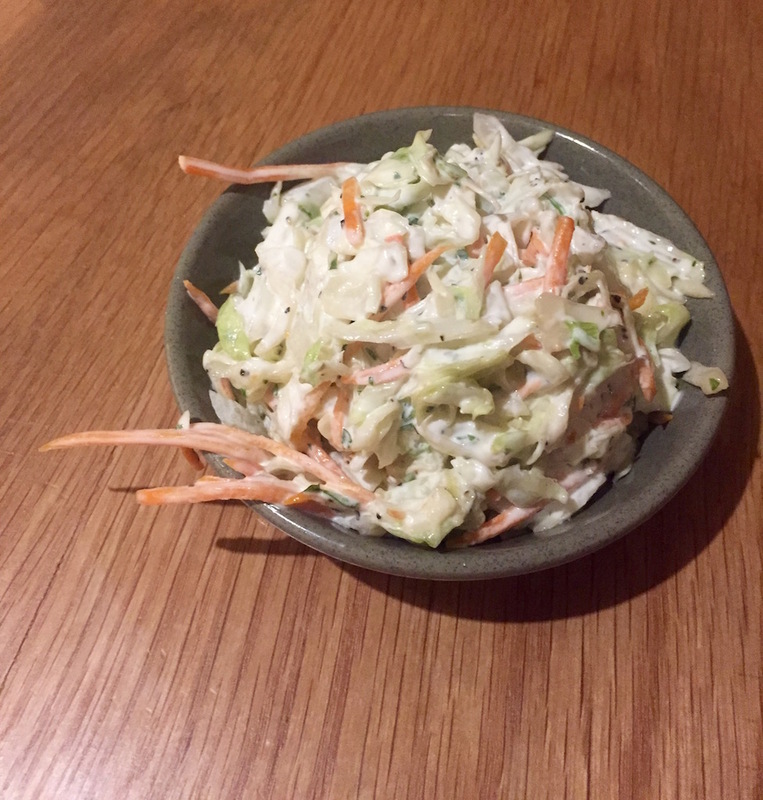 Coleslaw was terrific too (moist, but not wet... perfect amount of mayo.) I love it, because it's one of the few items that cools in this place. Plenty of carrots too, and the texture is spot-on (of course.) I've never once had a bad portion of Portuguese Rice (it's simply the best of its kind, including homemade versions) yet the mashed potatoes wound up topping it on this occasion. Perfect mash? What can't they do? Perhaps dessert... but alas, no such (bad) luck. 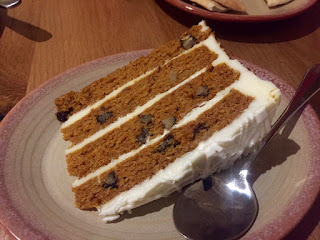 Their extra-layered Carrot Cake is generously sized with a nice combo of pineapple, raisins and walnuts (great crunch.) The cream cheese icing's good as well, sweet but not too sweet. Overall, nice & moist... and worth having again. What isn't worth having again? Nando's is one of a handful of area restaurants, I never get tired of. It's affordable, fast and modestly chic. Service is stellar: All customers are recognized, coming and going... no matter how busy it gets. Best of all, they're (finally) just down the street from where I live. Ain't life grand?